This is an example of a traumatic vascular injury in the central nervous system. Unfortunately there is no clinical data for the specimen. A side view of the specimen shows a fracture in the left parietal region. This is a common site for a skull fracture. followed by a massive arterial haemorrhage. 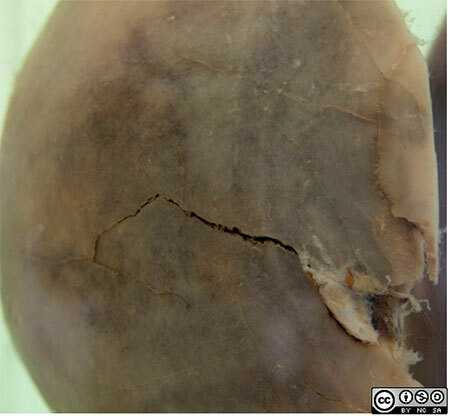 The haematoma which formed has a smooth convex profile. The haematoma would have compressed the underlying brain, resulting in pressure effects leading to the patients death. On the opposite undamaged side of our specimen the pterion can be seen as a thin, almost transparent area of skull. 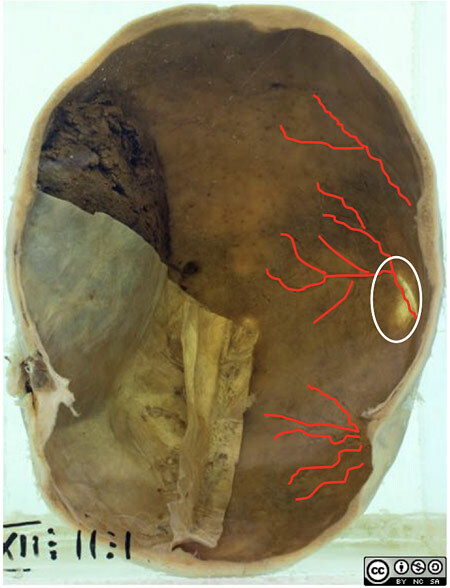 Note the location of the haematoma, it lies between the dura and the internal surface of the skull i.e. it is epidural or extradural . See a case of subdural haemorrhage in the collection.